I like this blog: The Dashboard Spy. Lots of screenshots. I posted recently about the Murdoch/Vivsimo story reported in the Pittsburgh Post-Gazette. This post on a web based message board (Yahoo! 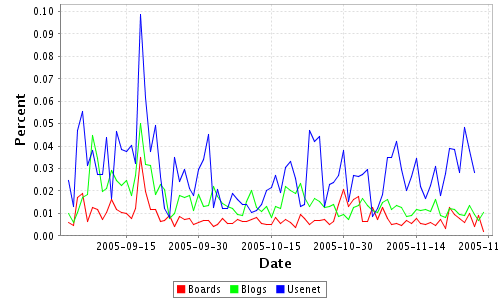 Message Boards: LOOK) generated a most of traffic to that post. As we think more and more about the conversational structure of the blogosphere, rather than thinking about it as a walled garded, we need to think more and more about how it integrates with other spaces on the web. I've been saying for a long time that those interested in analysis over the blog space are going to be knocked out when they see the potential of other similar spaces, most noticably the message board space. They are going to see topics of conversation which are more richly represented in other spaces, they are going to see different (and stronger) community structures, and then they are going to have fun integrating analytics from both. Here are a couple of examples. The first trends 'murdoch', the second trends 'xbox'. Notice that while there are echoed trends (the large peak to the left), there are also trends which are unique to each source. 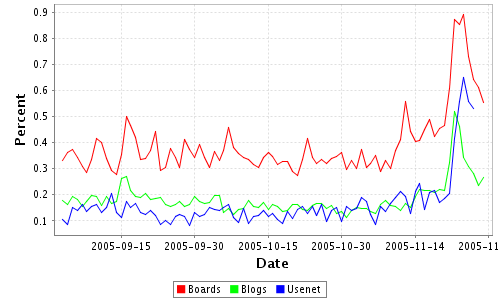 For example, Usenet appears to show an upwards trend to the end where as Boards and Blogs show a steady flat trend. Here we can see that a higher percentage of Boards are focused on the XBox. In addition, there is an initial peak - an anticipatory burst - which preceeds the main launch peak. Notice too the leap in Usenet posts. To give full credit to everyone involved in the conversation, visualization like those posted on Anjo's blog (just been updated I see) need to include links at least to external (non blog) pages. The fact that a message board concerning LookSmart is discussing a story I'm interested in (Vivisimo) is certainly a thread I'd like to follow. (These images are copyright Intelliseek). Yesterday, Corante launched its first series of hubs: marketing, media and web. The hubs bring together expert bloggers in the various fields, aggregate their feeds and top it off with an editorial blogger-in-chief. I'm very excited to be involved in this new endevour, and - I have to say - somewhat flattered to be counted in such good company. If you've not already been there, take a look at Xooglers - a new blog written by ex-Googlers recounting life at the search company. There are now two contributors, Doug Edwards (the original Xoogler) and Ron Garret (who also writes at Rondam Ramblings). First, I accept that Larry and Sergey really are brilliant. I'm sure that on IQ tests, they're off the charts, but that's not the kind of brilliance I mean. I mean brilliant in the sense that they have a vision that burns so brightly within them it scorches everything that stands in its way. The truth is so obvious to them that they have no patience for the niceties of polite society when bringing that vision to life. 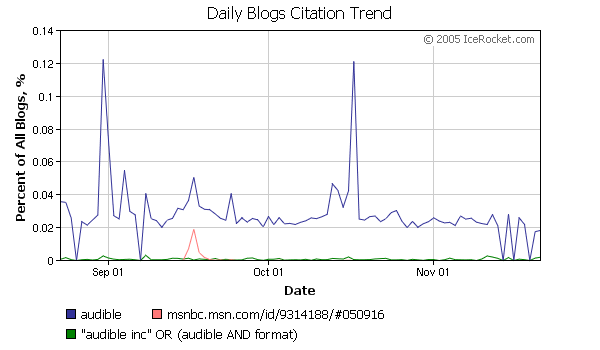 So Audible largely won in the eyes of the media - the sole basis for how we used to define PR. Of course, we no longer live and die by traditional media alone. In the blogosphere it was an entirely different story, as this IceRocket trend graph shows. I see two major differences here. IceRocket shows two large spikes - one in late August, the other in mid October. BlogPulse shows a single spike in early September. The other is the two smaller spikes in the BlogPulse trend (note that IceRocket has a couple of zero data points around the same time). BlogPulse allows you to drill down on specific dates. IceRocket doesn't have this, and as their custom date range query from the advanced search page is broken (it doesn't appear to work in either FireFox or IE), I can't yet determine what the spike in the IceRocket trend actually is. I get a big kick out of trend graphs. However, it takes some care to work with them in the blogosphere. 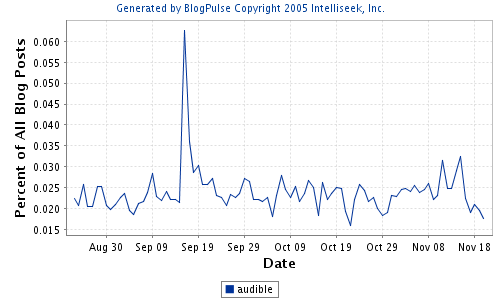 For example, every mention of the word 'audible' is not a mention of Audible Inc. - in fact, it probably the reverse. 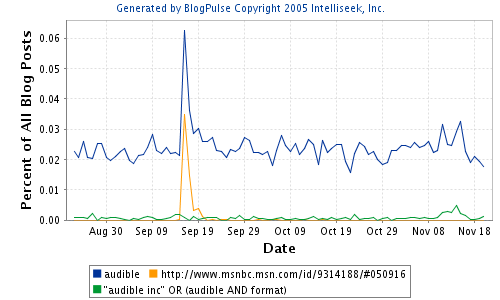 In addition, depending on what you trend over (blogs in the case of BlogPulse, RSS in the case of IceRocket) you see quite different results. If you are going to make any detailed use of trend graphs, you need the ability to inspect interesting features (either by drill down on the graph or by date specific queries). The conventional wisdom is to keep a track of the most visited (popular) posts on your blog and highlight them in some way. The trend graph from my original post regarding the rise and rise of PostSecret brings lots of traffic as it is in the first page of search results for Google's image search. So here is an update. 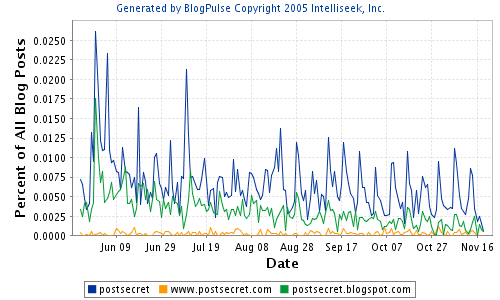 Unlike the previous graph, we now see PoseSecret's trend declining with no additional bursts. The top graph shows message volume as a histogram and burst as a red line. 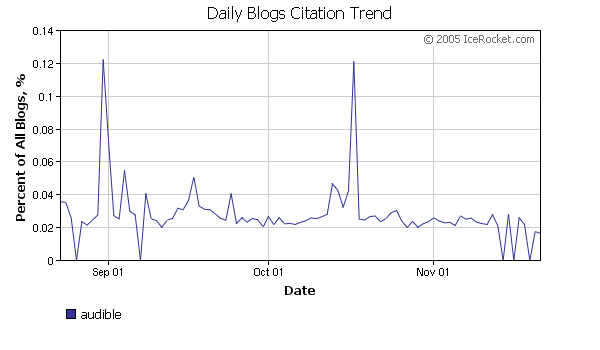 The bottom graph shows counts of postive and negative messages including the topic searched for. The graphics are interactive. Note that the data spans 6 years of data. You can drill down into the graph and get more constrained views of any window. Search results also provide details of positive and negative language within actual posts as well as classifying blogs and online diaries (which have traditionally been a separate class of content in Japan - predating blogs). Firstly, there is a lot of data out there about visitors that is unprotected. Secondly, wouldn't it be great if someone could provide a service that mined all this stuff - which is a sort of back-end data set to the front-end blogosphere - to provide insights about who is visiting your blog, who their visitors are and what the community of readers is (not just the community of blog writers which is what people mostly write about).